As I’ve never come across this in the past, I assume is something new introduced by Google very recently. It’s interesting to see that this applies to other news too, if there’s a relevant Google Plus post published. Tested on the UK and US version of Google News at the moment, it’s kind of a game changer for the publishing media companies. Publishing media companies struggle to win customers, by allowing a certain amount of content to be freely available to their visitors on Google News. While this might be easily overcome by deleting cookies in order to bypass the gated content (and receive your First Click Free articles every day if landing from Google News), the fact that now more competition is being added without the necessity of going through the long and difficult process of getting your website into Google News (the right article type, section, formatting, sitemap etc.). In my opinion, the space reserved to the Google Plus posts right above the rich media section (videos, pictures), makes them more visible to the eye, hence driving more attention=clicks. The potential here it’s enormous. 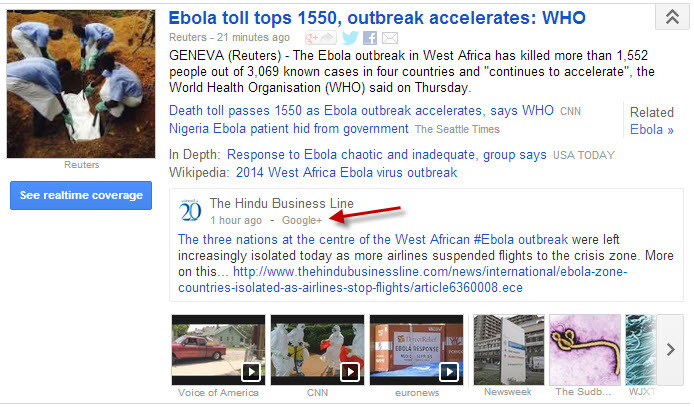 The quick win for those who aren’t already on Google News is to start publishing in their Google Plus page regularly. If you’re asking if your G+ page needs to have also a specific website, with relevant information, my answer from what I observed is NO. Appallingly so, there’s no need to have an official G+ page related to your business, so anyone with a good writing skill can potentially appear in Google News. This said, I’m curious to see more about in the coming weeks.